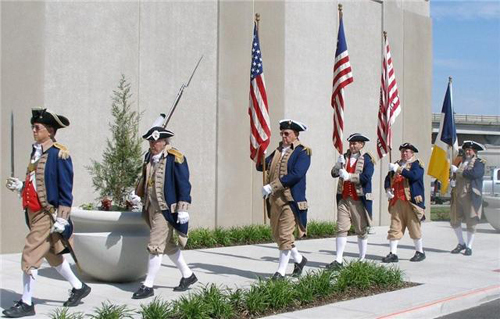 Both the MOSSAR & KSSSAR Color Guard Teams participated on May 23, 2009, during the opening ceremony of the National Archives Dedication and Open House event, located at 400 West Pershing Road, Kansas City, Missouri. 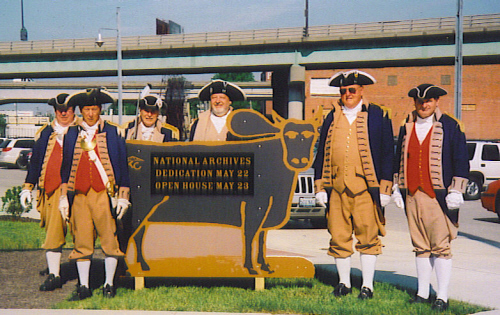 The National Archives celebrate their 75th Anniversary and the dedication of this new facility. 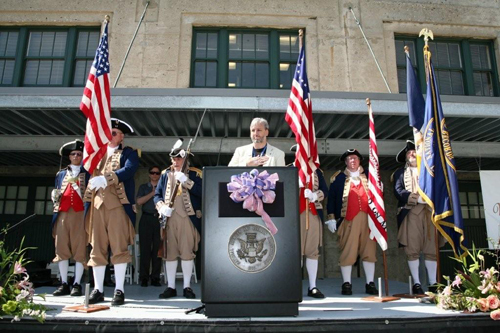 The renovated Adams Express building will serve as the new home of the National Archives at Kansas City, which is located within the historic Union Station cultural district, and in the heart of Kansas City. Left Photo (L-R): Robert L. Grover, MOSSAR Color Guard Commander; Major General Fred Kaffenberger, KSSSAR Color Guard Commander; Compatriot Dewey Fry; Compatriot Dirk A. Stapleton; Captain James L. Scott; and Compatriot Bob Capps. Major General Fred Kaffenberger, Compatriot Dewey Fry and Compatriot Bob Capps are from the Delaware Crossing Chapter of Kansas. Center Photo (L-R): Captain James L. Scott; Robert L. Grover, MOSSAR Color Guard Commander; Major General Fred Kaffenberger, KSSSAR Color Guard Commander; Compatriot Bob Capps, Compatriot Dewey Fry; and Compatriot Dirk A. Stapleton. Major General Fred Kaffenberger, Compatriot Dewey Fry and Compatriot Bob Capps are from the Delaware Crossing Chapter of Kansas.